TAO GROUP BLOG TAO NIGHTCLUB LAVO NIGHTCLUB TAO BEACH LAS VEGAS: TGIF! WHAT A NIGHT! Last night was another memorable TAO night as we had special guests all over the club. Model Sarah Larson hosted the night, the Vegas girl arrived with 10 friends at 10pm. with a ton of press awaiting the local beauty she worked the carpet like a true pro. After dinner Sarah took over the Dancefloor VIP area by the owners table. Also coming in last night was American Idol and So You Think You Think You Can Dance star Nigel Lythgoe, who chose the more reclusive Skybox for his friends. 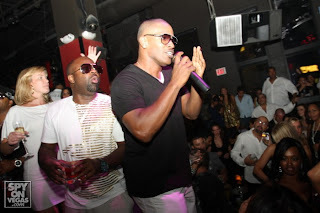 Around 230AM TAO Regular Jamie Foxx joined us again taking over a dancefloor table and immediatley jumping on TAO's Catwalk with mic in hand to get the party going to the next level. Jamie MC'd the party for over an hour, having the club chant back to him, drinking Cristal and singing along with Hip hop classics spun by DJ REACH. Also, making a surprise appearance was actress Ashley Scott, who co-starred with Jamie in "THE KINGDOM". Ashley was celebrating her birthday and joined Jamie at his table fo a bit, he ofcourse bought her some Cristal for the occasion.